Long serving Kogalo Ronald Ngala has come out to allay fears among Gor Mahia fans. According to Ngala, the club has resolved the issues that caused players to threaten a boycott. “We are definitely going for Cecafa Kagame Cup. There was some disquiet in the camp but now everything has been sorted out and we are ready to go. We are traveling tomorrow (Friday) at night after the Sony Sugar match,” Ngala told Standard Sports. Club secretary Ben Omondi echoed Ngala’s sentiments and emphasized that all is well and the club is rearing to play SoNy Sugar. 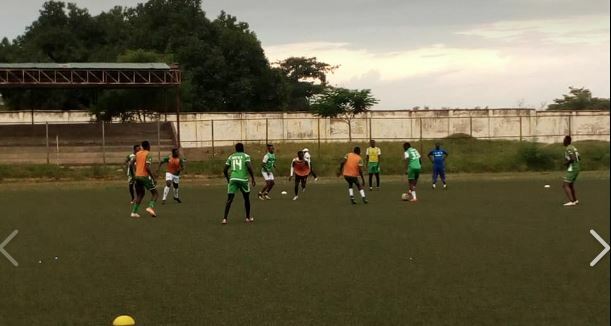 The disquiet was due to unpaid dues and some players were said to be disgruntled because they were given only one third of the prize money that came out of the recently concluded Sportpesa shield. But Sally Bolo claims that the players are not owed anything. “We don’t owe any player salary arrears and in terms of win allowances, the only game we have not paid is Tuesday’s against Posta Rangers. The only thing we owe them is the money from the Confederation Cup qualification and this, we promised we would pay 20pc of it,” Gor Treasurer Sally Bolo said to Capital FM. Coach Dylan Kerr for his part is unhappy with what he sees as sabotage from some club officials. “I am not happy with one club official because she has no right to set players to initiate rebellion. She is an official and should be in the front in trying to solve issues not worsen them. She is causing problems in the team and it is unbelievable. I think the club needs to sort this out as soon as possible,” a dejected Kerr said to Capital FM. It has been suggested that the club official who incited the rebellion is Judith Nyangi. Kerr also said he will assess Burundian striker Francis Mustafa who arrived in the country on Thursday. We don’t have much time because it is just one training session with him but we will see. It’s only two days to the end of the transfer window which doesn’t give us enough time to look at a player,” Kerr added. The Kagame cup kicks off on Friday. Group A: Azam FC (Tanzania), Vipers SC (Uganda), JKU FC (Zanzibar), Kator FC (South Sudan). Judith Nyangi…prepare for short race. You can not bring confusion in the club. Not now!!! Mr. Administrator this anti-spam software of yours is a big nuisance. Besides, it is totally obsolete. Why do you allow a machine to manipulate the outpouring of our sentiments? We have blogged here for generations without this ka-thing and we never saw any spam. Kindly revert back to the old system. This one cannot even get the time right. In the words of JTG, kindly allow us to air our views freely as was in the days of Vincent Ocampo, Pundit etc. All along the stand was that the club does not need new players… so why the scrumble for the Burundian with one day trial. And again why the so many lies from officials. One question… was this 20pc an agreement reached with the players, cause to me it sounds too little. Why pay me what you owe me like medical prescription when you’ve just hit the jackpot? The officials have the right to go to the press and state their side of the story but when do we get to hear the players side of the story? There is No way an employee can go to strike if he is not owed any money! In my opinion it is this Judith Nyangi who is fighting for these players. I also disagree with Kerr. Understandingly he wants players in camp, but I thnk Judith has sided with the players on whatever sums they are being owed or the amount being paid. Allbeit Kerr did not like her methods. So what is clear is that players never demanded part of the 27mil but are simply asking that their arrears be paid. So before we go haywire on lynching Judy, can we first here what’s her beef, I thnk she has a story to tell. All this comes down to sloppy EC management. When is the player’s concern being heard? Spot on @ jasego, the matter can be resolved by simply reviewing all existing player contracts and inserting the necessary clauses so that it addresses the future. I think the player revolt is welcomed inconvenience and should now be a basis to improve everything else that is on the table otherwise it will just happen again. When we are dealing with what is going on in Gor , to get the true picture, it sometimes helps to put things in context otherwise we run the risk of ending up with a one dimensional conclusion to a situation that is otherwise multi dimensional , one conclusion that is beginning to gain currency is Oh Nyangi this , Nyangi that , but is that the complete picture?, I dont think so . Our conclusion should be guided by How it should be , but in this case we are dealing with how it is . How it should be is that fifty plus years after our formation, we should be having a defined structure that incorporates al stakeholders I.e the EC , the TB, the players and the Fan base , so that everybody knows their lane, their role and their boundaries . .who for example is the official spokesman for the club ? , etc etc . The situation as it is , is a consequence of the situation as it should be and rather than blaming Nyangi who is merely an excited pawn, who we should and must blame is the chairman because he is the one who is entrusted with the mission and vision of the club . But it is my contention that the situation as it is has rather than being discouraged, has instead been encouraged with a specific outcome in mind-Corruption . While we get outraged with Nyangi’s action , remember that she is a useful tool for the power that be moreso when the begging bowl needs to be unveiled , Bolo is a necessary fool who is expected to embarass herself when uncomfortablesitiations need to be explained e.g that explanation of hers when they were caught with their fingers in the til in kisumu vis a vis fake tickets -that they decided not to take any action against the culprit bcoz he was related to some official, surely . Look at another unique situation where the substantial secretary general is not the official SG but his Deputy . And then we have the CEO who has no time for anybody else but the chairman . When the head is disfuntional , the effect is felt by the rest of the body I.e the TB, Players and the fans and hence so long as we dont deal with the head , we must be prepared for more Nyangis , more Bolos , more Ngalas , more annoyance from Kerr , more player unrest and a more very annoyed fanbase . The Nyangis are merely a consequence of a head that pretends to be disfunctional so as to enable what we are witnessing for the sole benefit of himself and some crumbs for his cronies . in some briefcase as we are kept busy with other costly diversions . All we can do is to wish them the best, today and in the next two weeks. From what I gathered some times back was that the EC will be structured to conform to the Sports Act. In that case we will only need a lean office of maybe 3 officials and a secretariat. Hope we get that done. @Jasego apart from the Burudian, any other player, even a local one being brought in? What happened to Ovella? or is it a case of ‘I must go play abroad’ like most of our players who have gone to obscure countries football-wise? Guys with all that has transpired, I am of the view that we should brace ourselves for an early exit from CECAFA. The will most definitely not toil if they know that at the end of the day they will be fed only on left overs. The boys will most definitely not toil if they know that at the end of the day they will be fed only on left overs while the EC shares the prime portions. @Barefoot Bandit. Do not be a prophet of doom. We are all supporting Gor Mahia as our club and we should be optimistic no matter the goings and circumstances around the club. Let us encourage the boys to do well. We should all understand that all the prize money cannot be paid to players. Note that we do not have a permanent sponsor and the club needs to invest and save for the future. Its poor policy to invest all our income in consumables and forget capital expenditures. @Colo, kindly inform us of this club investments,? ?.Could a trip to Russia to watch world cup be one of them?? I want to thank God, coach Ker and our boys for honouring the SoNy fixture. It is good to note that Kahata is available. I think he will play once his International Transfer Certificate is sent by his former federation. On a day the doomsayers had sharpened their swords waiting to go for the jugular of perceived enemies of the players , these boys continue with what we had anticipated through it all , three points , a clean sheet and a happy ending to an exagerrated and overblown crisis .